Having pictures on your blog and website, and in your social media posts is an important feature. Many readers will be drawn into your page by the images you use. Most people don’t even realize the subtle power of a picture. Pictures on your website can be as minimal as “eye-candy” or as powerful as “a thousand words”. Studies show that people are more likely to read further on your website or blog page if there is a picture on the page…or several. Using eye-catching images in your social media posts is a sure way to get attention and clicks to your content. According to Hubspot, internet marketing experts, 90% of information going to the brain is visual, and visual content is processed 60,000 times faster in the brain than plain text. Images are powerful tools. Adding pictures to your blog posts help you expand your content. In many ways they help you explain your content. A picture can make your post more memorable. People often need an image to anchor an idea, so often the image itself will stimulate the idea. Pictures break up the “wall of words” on the page. When you place them well, they actually draw the readers eyes down the page. Local, geo-tagged photos that you’ve taken on your smartphone or digital camera add some extra SEO (Search Engine Optimization) to your website. Well designed images can add subtle information to your posts. You can add humor, informative details (infographics) and you can reinforce an idea that you’ve developed. 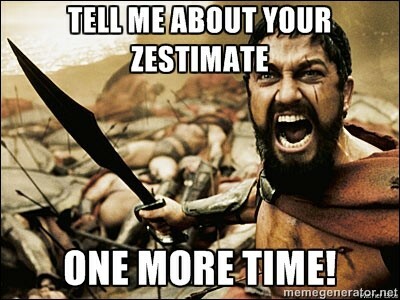 This is a meme I created to go with my article explaining the problems with Zestimates. It tells a story, don’t you think? 🙂 There are several fun meme generating websites, just do a search and you’ll find more than you know what to do with. This was created at memegenerator.net. There are many apps available today that make it easy to take photos, edit them and upload them to your website, or to Facebook, or other social sharing platforms. It’s always safer to take and use your own photos. If you want to keep someone from using them, you can add a watermark. Many apps have that feature. You can also use photo editing software, or some popular sites like Canva, or PicMonkey. There are probably hundreds of great apps that all do creative editing on the go. Cinemagram. It turns a short video into an animated gif. The unique thing about this app is that it allows you to swipe over a portion of the photo to make it animated. Imagine a photo of the front of a house with the wind blowing the branches of a tree. You can make everything still accept the branches you swipe. Really clever. Vhoto is another app that turns your short video into an animated gif. Skitch is an app that lets you quickly and easily add font, stickers, and effects to photos. Pic Collage lets you put multiple photos into a collage that you design. Layout does a similar job, with several pre-arranged layout choices. Another good one is LiveCollage. With Ripl you can combine multiple photos into a video and post directly to Facebook. WordSwag turns your ideas, quotes, or content into beautiful graphics, then you can share it directly on social media. It’s a great idea to have your smartphone handy when you’re out and about, so you’ll always be ready to snap some pictures of communities and neighborhoods, local events and parks and scenic landmarks. You can keep these available for use on your website. You’ll have unique, local content that no one else has. If storage becomes a problem, you can store your photos on a flickr account, or in your google storage. You can set your phone so photos automatically get stored in whatever online storage you use. You cannot “take” any photo that you find on the internet and use it. This is content theft, or plagiarism. If it’s found, you can pay lots of money in fines. There is, however, a group of photos that are open source. [Creative Commons] The owners of the pictures and photos have agreed to let their work be used by others on the web. There are various licenses for the use, some of which require attribution, some don’t. Some are not for commercial use, some are. 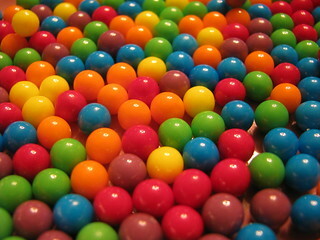 Creative Commons is a good system to find pictures that are permitted to use on your content, usually with attribution. Attribution means that somewhere on the page you link to the owner of the photo. [see bottom of post] Read this to understand more about creative commons use.